The film is really just another variation on the same story Disney Animation Studios has been telling since 1939, but it still works. No one sends up Disney quite like Disney. Even when gently parodying itself, there's still a level of sincerity at the core. Its latest animated offering is no different. 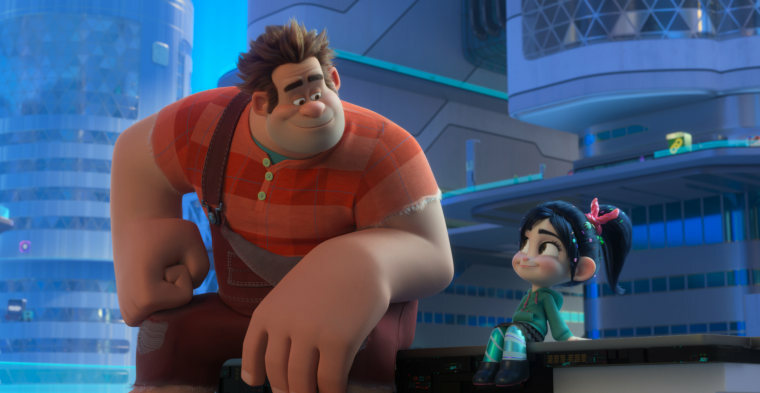 Just in time for the Thanksgiving holiday weekend, "Ralph Breaks the Internet" was created by the minds behind Disney Animation Studios, the division of the entertainment behemoth that originally put it on the map. A follow-up to the 2012 surprise hit “Wreck-It Ralph,” this sequel sends up all the company’s own clichés while reminding everyone that all Disney princesses, no matter where they come from, are just trying to follow their dreams. This sequel sends up all the company’s own clichés while reminding everyone that all Disney princesses, no matter where they come from, are just trying to follow their dreams. With Disney poised to merge with 20th Century Fox in less than a year, the company stands as the largest entertainment monopoly in the world. And yet, endless remakes and franchises have recently left something to be desired as far original content is concerned. Disney Animation Studios made the company iconic with stories that told a clear moral tale of family and heart, packaged and marketed to the hilt. But the overall company’s acquisition of other studios and a new habit of co-opting these once-animated stories for CGI-heavy “live action” remakes has meant that the animation department has been overlooked these last few years. While fans fawn over Pixar’s next “Toy Story” installment and Tim Burton’s “Dumbo” trailers, Disney Animation Studios has had to get creative about where the niche is for them to fill. Enter the “Wreck-It Ralph” series, which takes the “Toy Story” formula and moves it to the dawn of the digital era. The toys who come to life when the kids aren’t around are now arcade characters who wander out of their video games after closing. The original story, which was equal parts nostalgia, gentle parody and heartfelt buddy parable, centered around Wreck-It Ralph (John C. Reilly) from “Fix-It Felix Jr” (a parody of the 1980s game “Rampage”). Ralph was paired up with Princess Vanellope Von Schweetz (Sarah Silverman) from “Sugar Rush” (a parody of every female-oriented game mixed with a parody of every racing game of the era) who together form an unlikely friendship so touching, the film was nominated for an Oscar. “Ralph Breaks The Internet” takes this 1980s parody and moves it to the present, as the old school arcade finally gets WiFi. When Vanellope’s game is damaged, and the only replacement part can be found on e-Bay, Ralph decides to take his little friend out into the great internet unknown to find it before her console is dismantled and sold for parts. The trip that ensues feels like a digital version of “Fantastic Voyage,” or Pixar’s “Inside Out.” Human avatars are enveloped in a little bubble packet of data and flown through wires to the global World Wide Web, citified. Here. the social media district is dominated by a large blue book with the word FACE on it and Twitter birds fly through the air spouting endless cat pictures. Google’s skyscraper dominates the landscape and eBay is a warehouse of enormous size. A trip to the “dark Web” finds everyone in dark glasses and hoodies, as unscrupulous pop-up ad dealers try to make a buck or two selling virus-laden cons. And, of course, over in one corner stands the entertainment district, dominated by a large pink castle and its flagship site, Oh My Disney. Ralph, discovering he needs money to buy the Sugar Rush part from eBay, starts making viral videos on “BuzzTube” — an opportunity for the filmmakers to reference every viral YouTube video of the last few years. Meanwhile, Vanellope and her racer’s heart discovers the latest generation of racing games when she enters “Slaughter Race” (an obvious parody of “Grand Theft Auto”), where the bad guys are led by Shank (Gal Gadot, doing a take on her “Fast & Furious” character). The premise is creative enough, and anyone who understands internet culture will appreciate the attention to detail. But the movie really shines when its main characters enter Disney’s colonized corner of the internet. Part of being an entertainment monopoly today means being Extremely Online, and Disney’s send-up of its own digital footprint is clearly done with love. The security at Disney is run by Stormtroopers, Buzz Lightyear stands outside entertaining the crowds, an animated Stan Lee wanders out of the Marvel building and endless comic-con panels run day and night. The main draws, though, are the iconic princesses that made Disney a household name. The company released footage of these princess scenes ahead of the film's release, and it represents a microcosm of everything that makes the movie work overall: A visual feast of meticulously crafted puns that avoids self-indulgence by managing to always gently push the plot forward. Cleverness aside, at the end of the day the real emotional center of this movie is (still) the friendship between Vanellope and Ralph. They may get into fights and internet viruses may try to exploit their insecurities, but in the end, theirs is the timeless love story of a big, strong self-declared hero and an itty-bitty princess with a dream to drive free. It’s just another variation on the same story Disney Animation Studios has been telling since 1939, but it still works all these generations later.